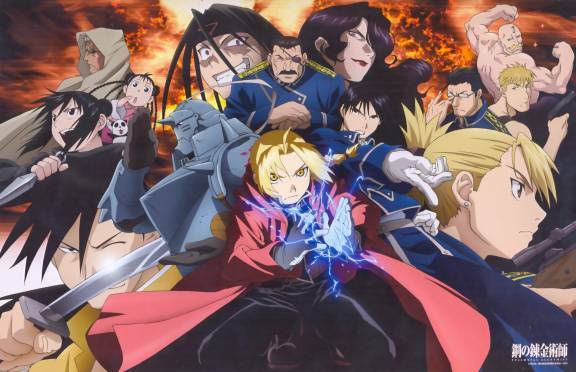 The Fullmetal Alchemist is one of my favorite anime. For me, I had watched it at least 10 times! Why I loved it? Here’s my reason! First, the perfect story-telling. The Fullmetal Alchemist has 64 episodes which is a medium-length anime. However, all the episodes is just about one story. With the development of the story, you will discover the story is just like a circle, all of the part are connect. Things happened in the first episode is foreshadowing the later part.There’re no subplot, just focus on one story. As a result, all plots are neceressary. One of the most interesting things that when you watch again is to find the foreshadow of the story. Next, the theme. We can discover the theme of The Fullmetal Alchemist is anti-war. Even experiencing so much darkness, people still long for the brightness. People may made mistake, including the main characters, but they will try to make more effort to make up for their own mistakes. Everyone in the anime is not innocent, even the main character offended the taboo. As a result, the character is round-shaped. Last, the anime has include some philosophy inside. One is all, all is one is one of that. Also, villains in the anime represent the seven sins. But their death is contrary to the sin they present. Pride becomes the most innocent infancy, Greed is satisfied when he died. Wrath ends with clam it the end. All of the details are interesting.